Dealing with ever diverse and complex projects, means the combination of various processes are necessary to achieve the desired result. 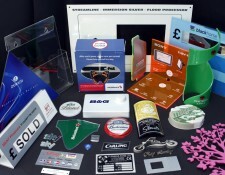 In addition to engraving, we offer screenprinting, pad printing, rotary printing, linebending, diecutting and creasing as well as a design service. The group photo shows some of these processes and the variety of work we encounter daily. 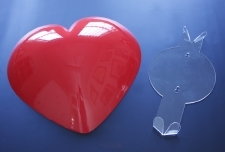 For this exercise we had to make vacuum formed hearts that colour matched the red pillars they were to be mounted to, giving the impression that they were an integral part of their background. This involved making brackets that pulled them to the surface, see photo.